What says fall flavor more than pumpkin? 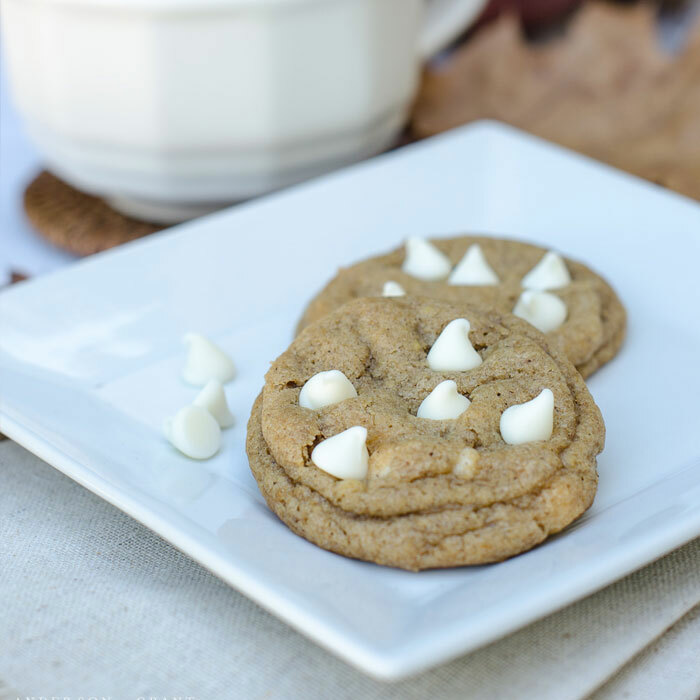 This recipe for Pumpkin Chocolate Chip Cookies gives a fancy bakery touch to a traditional favorite cookie for the autumn season. 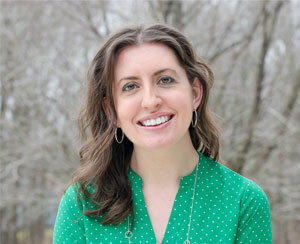 Affiliate links are provided in this post for your convenience. For more information, you can view my disclosure policy. Sometimes all I need is a push in the right direction and a little inspiration. 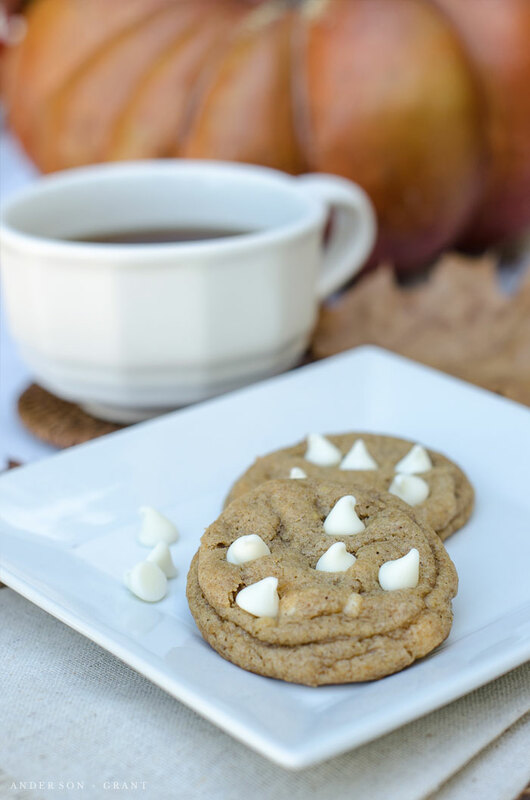 For the past five years, Michael at Inspired By Charm has held Fall Cookie Week on his blog and is often the source of many of those must-try recipes. 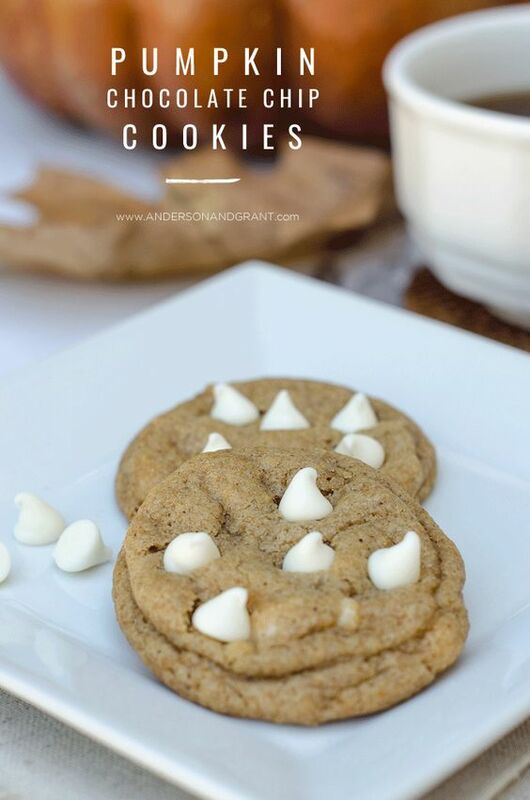 Today I'm sharing one of my favorite recipes for the week, both because the cookies are delicious and because they turn out really fancy without a lot of work. Great presentation scores high marks in my book. The recipe is for Pumpkin Chocolate Chip Cookies and was adapted slightly from a recipe at Chelsea's Messy Apron. 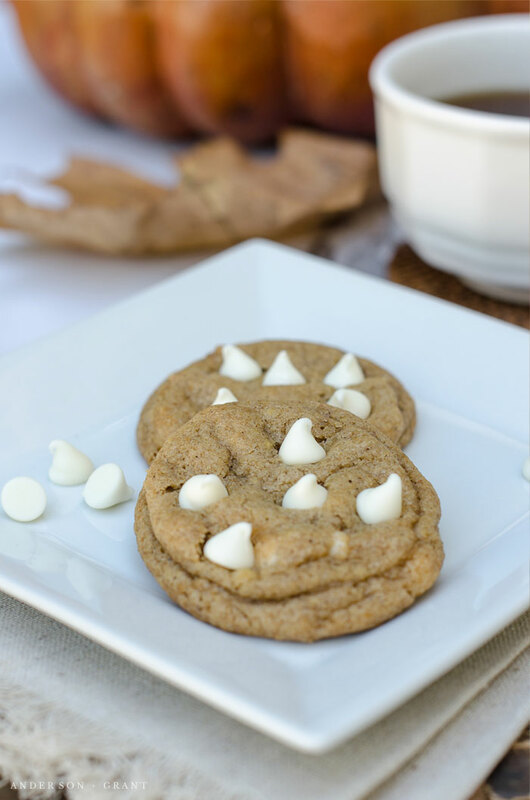 Parts of the recipe sound a little complicated, but believe me.....the steps are there for a reason and allow you to create cookies that are chewy on the inside, crisp on the outside, and full of fall flavor! Chelsea did her research when putting this recipe together and some of the things I learned will be used in other cookie recipes I bake. Also, since you won't be using the whole can of pumpkin for this recipe, you may want to take a look at making this Pumpkin Pie French Toast for your breakfast....so good! After mixing the dough, it should be refrigerated. And then the prepared cookies need to be placed back into the refrigerator before sticking the baking sheet into the oven. If these steps are omitted, your dough will spread too quickly and you'll end up with very flat cookies. Chocolate chip pancakes is not the look we are going for here. As strange as it sounds, for every cookie that you make, you'll need to form two small balls of dough. Then stack them one on top of the other like you're building a snowman. This is how they should be formed when they are chilled and placed in the oven to bake. Do not flatten them out into a cookie shape. The ball of dough on the bottom will spread out and bake first, and then the top ball will bake down into the bottom. 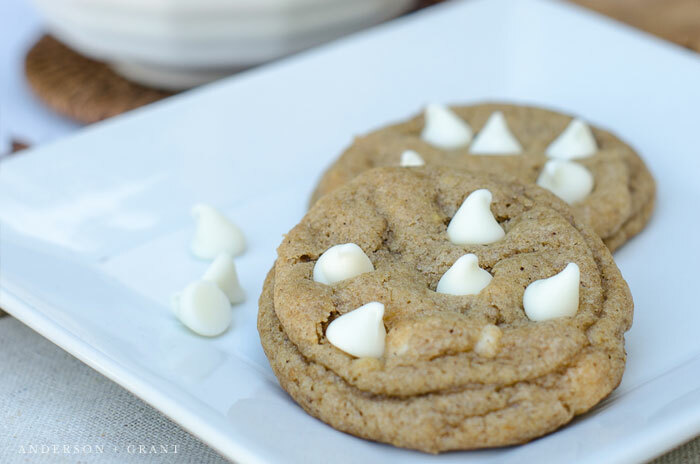 You'll end up with a cookie that is chewy on inside with that layered texture on the outside. When baking anything with flour, how you measure the ingredient determines how successfully your cookies will turn out. Too much flour will make these cookies turn out cakey and too little flour will make them spread out more than they should. I did a post not too long ago with everything you need to know about measuring ingredients. My favorite tip I learned from the original recipe is to push more chocolate chips into the top of the cookie immediately after removing the baking sheet from the oven. This gives you that fancy, fresh-from-the-bakery look that will impress anyone you serve them to. Presentation is just as important as the taste of you food, and these cookies get an extra gold star in that department. Cut up your butter into chunks and melt it over medium heat on the stove. Watch the butter carefully and move it around in the pan often to prevent burning. When melted, remove the butter from the heat and allow it to cool slightly. In a large bowl, mix the white and brown sugars and then whisk in the slightly cooled butter. Then add the egg yolk and whisk until completely combined. Add the vanilla and canned pumpkin. Whisk again until combined. Whisk in the baking soda and 1/2 cup of flour. Then stir in the remaining 1 cup of flour using a wooden spoon. The mixture will begin pulling away from the edges of the bowl when the flour is added. Cover the mixture and place it in the refrigerator for at least 1 hour. Preheat the oven to 350 degrees. Line your baking sheet with a nonstick liner or parchment paper. Using the liner gives these cookies an evenly browned bottom and makes for easy cleanup. Remove the chilled dough from the refrigerator. Roll two small balls of dough and then press one ball into the top of the other. Leave them stacked and do not flatten the dough into a cookie shape. Create 6 to 8 cookies and then place the baking sheet in the refrigerator for 10 to 15 minutes. Take the tray out of the refrigerator and immediately place it in the oven for 9 to 12 minutes or until the cookies are lightly browned on the bottom. You want the cookies to be slightly under-baked to keep them soft and chewy on the inside. Remove the cookies from the oven and immediately press 5 or 6 additional chocolate chips into the top of the cookie. Allow them to rest for 1 to 2 minutes on the baking sheet before transferring the cookies to a wire cooling rack. 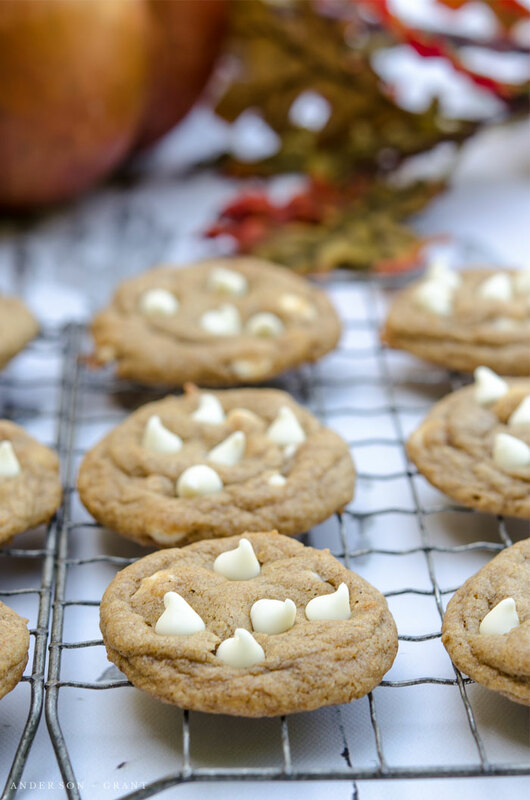 These cookies put the perfect fall touch to a favorite traditional cookie. And while they are yummy right from the oven, the flavor intensifies the next day. 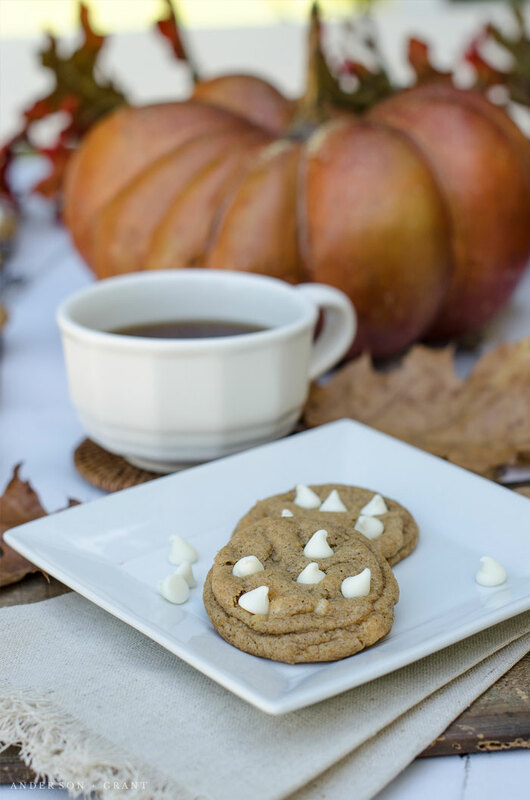 Pour yourself a cup of hot pumpkin coffee and enjoy a cookie or two (or three)! And for those of you wondering how I could possibly be eating this many cookies and baked goods all at one time.....I actually started baking about a month ago to prepare for these posts. And so far, the recipes I'm sharing here this week have stored very well in the freezer. It is really nice to be able to pull some cookies out in the morning for a quick fall snack later in the afternoon. What are your favorite recipes for fall baking?